Social media is continuously advertising wonder pills and fad diets that promise miraculous weight loss. I came across "The Military Diet" while browsing online. 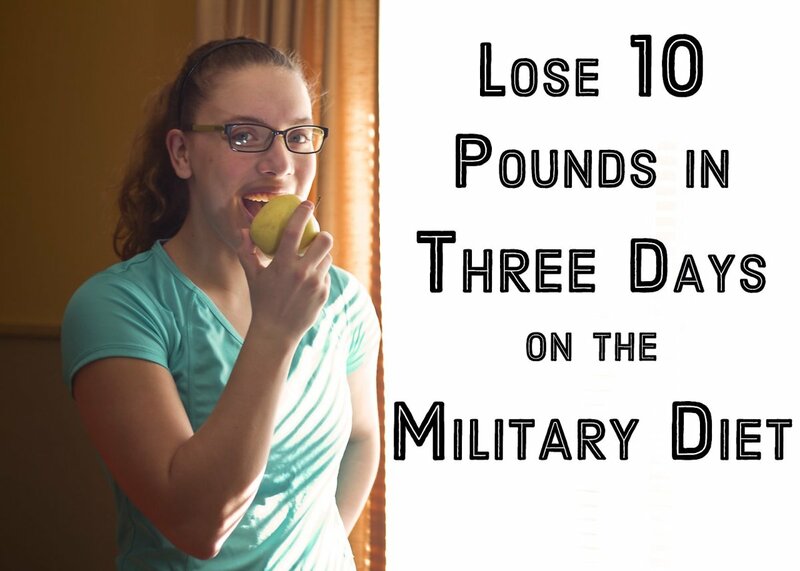 I don't want to take credit for another author's work, so here's the original source here: Military Diet: Lose Up To Ten Pounds In Three Days. I'm not one for quick fixes, but this one really piqued my interest. In the past 7 months, my boyfriend and I had put on quite a bit of relationship weight—pretty much the equivalent of some peoples' baby weight! We have spent the past several weeks going die-hard, balls to the wall, healthy. We cut out all alcohol, and upped our veggie intake. 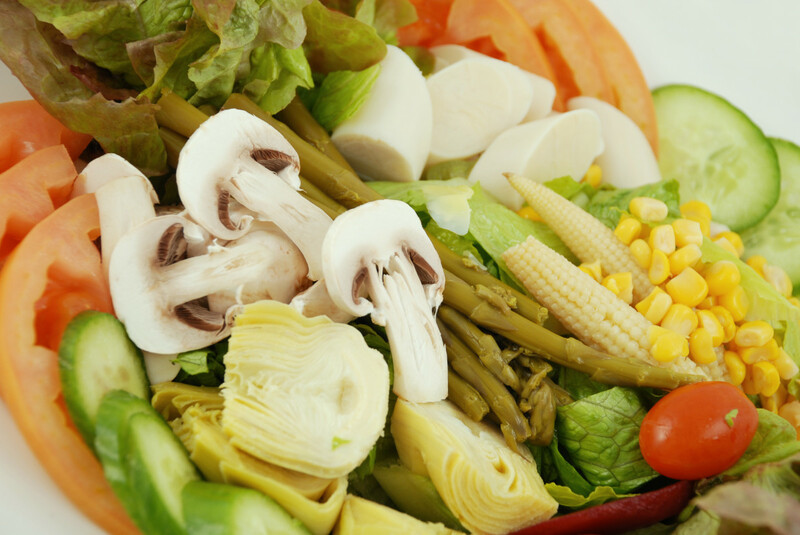 We had eaten salad with oil and vinegar dressing before every protein-filled meal. We work out 3-5 times a week. I knew that it was going to take time to get the 10 (okay, more like 15) pounds that I'd put on off, but I had already noticed a significant difference. I had gotten to the point where I noticed a difference in my weight, but I thought this diet would be an easy way to jump start my metabolism and help me out with getting back into some of my old clothes! This is the experience we had (from my perspective) with the three day Military Diet. 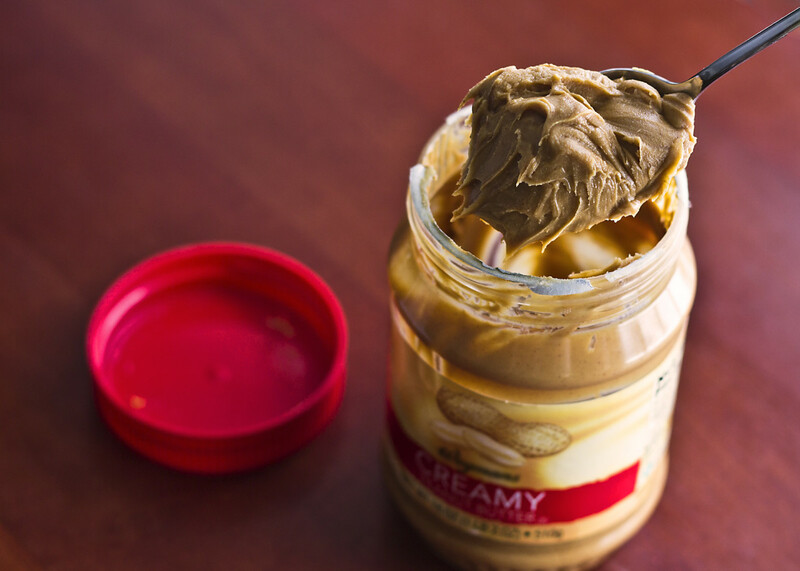 Before starting the diet, we stocked up on organic peanut butter and other necessary items. I found this diet cruising through some blogs online. The boyfriend was sitting across from me in the living room, and he took a glance at it. We both agreed that it was something we should try. After he consulted his personal trainer friend, his friend told him that that was way too few calories to be good for you, and that it was most likely just water weight that would be gained back quickly. After reading a few more articles and reviews online, we decided that we'd go ahead and head to the grocery store and give it a shot anyway. I'll be honest, I thought this would be easy-peasy. I had survived on almost a whole year of my early twenties on solely rockstars and Slim Jims. My boyfriend seemed skeptical on some of the food choices—he didn't really like cottage cheese, or grapefruit. We decided to not use any substitutions, and do the diet by the book. I made sure to check all the nutritional values online with the foods we were purchasing. I was worried I would get something with too many calories per serving. Most of the calorie values ended up being slightly less than the website. For example, the frozen chicken breasts from Trader Joe's were only 150 calories for 4 ounces, instead of the 300 I had read it was supposed to be for 3 ounces. I tried to just make sure the calorie count was not over, and stuck to the recommended serving size. Also, I had read online that men should up their calorie content by 100 calories a day, so my boyfriend got to eat a little extra. No biggie. We already had reusable water bottles that hold 32 ounces of water. Water wouldn't be a problem, because we were already used to drinking about 3-4 bottles of lemon water a day. We got organic peanut butter, with just peanuts and sea salt in it. 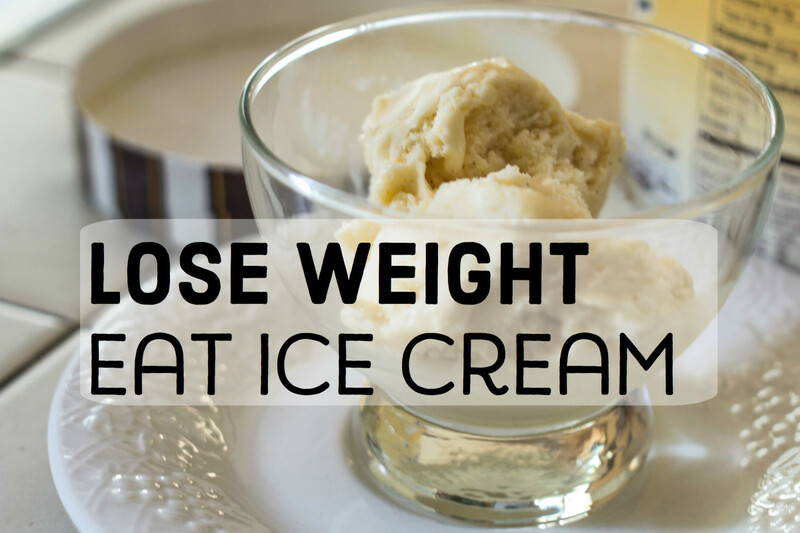 I was worried about the vanilla ice cream, but I was able to find some that was the suggested 300 calories a cup. Also, the canned tuna we had purchased was slightly lower in the calorie content than an article had stated. 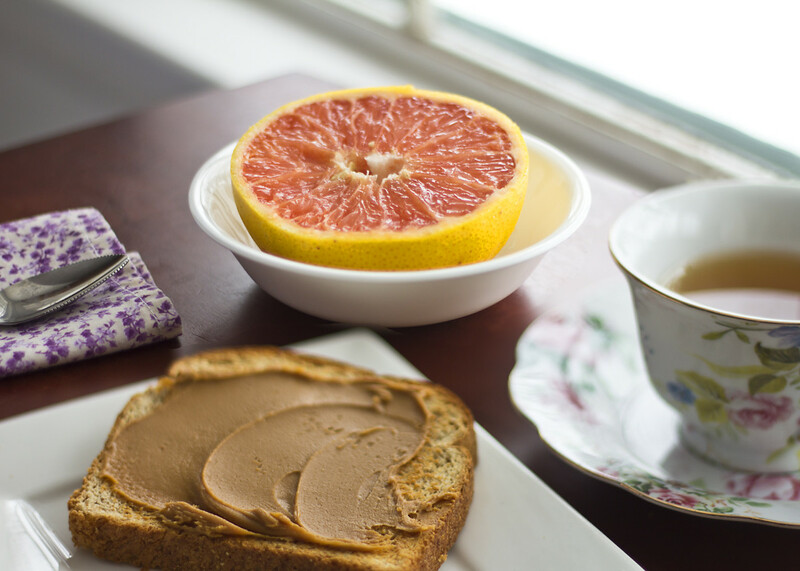 Breakfast: 1/2 a grapefruit, toast with peanut butter, and black coffee (I added skim milk to mine). Dinner: We steamed green beans and baked the chicken with lemon pepper. I've never been one for black coffee. I usually used just skim-milk, so I wasn't missing the sugar. I had decided after drinking this that I really didn't mind it black, and might just start drinking it like that from then on. My boyfriend had already gotten up and had his breakfast, so my half-grapefruit was cut and ready to go. The peanut butter seemed like it was about to spill over the toast, so I scooped some of it into a spoon and ate it like that. I felt fulfilled and not super hungry for about an hour afterward. Then I started looking at the clock, waiting for lunch. When lunchtime came around, The boyfriend and I were like starved dogs. 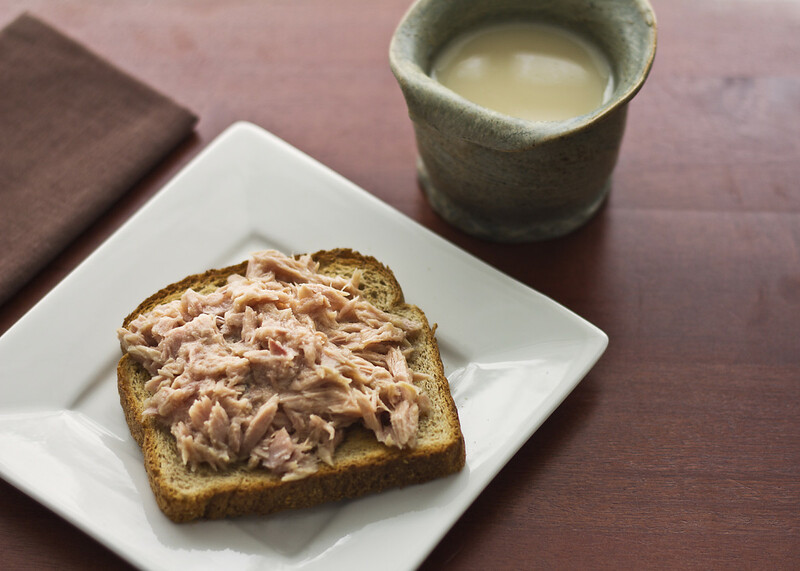 I had eaten tuna with just oil and vinegar before, but plain tuna was a little dry. It was still welcome because I was flipping hungry. The boyfriend was starting to seem a little discouraged, so I made it seem like I was fine. I knew he wasn't going to bow out unless I did. The coffee pot looked so tempting, but we both resisted the urge to grab second cups. Dinner was really similar to what we had been eating on a daily basis anyway. Because I was so hungry, I cut up my apple and sprinkled a little sea salt on it to munch on while I cooked the chicken breast. I steamed the green beans, and baked the chicken with just a little lemon pepper on it. Best part of the day? The ice cream. I cut up half of the banana, and mixed them together. So good! Breakfast: Hard-boiled egg on toast. 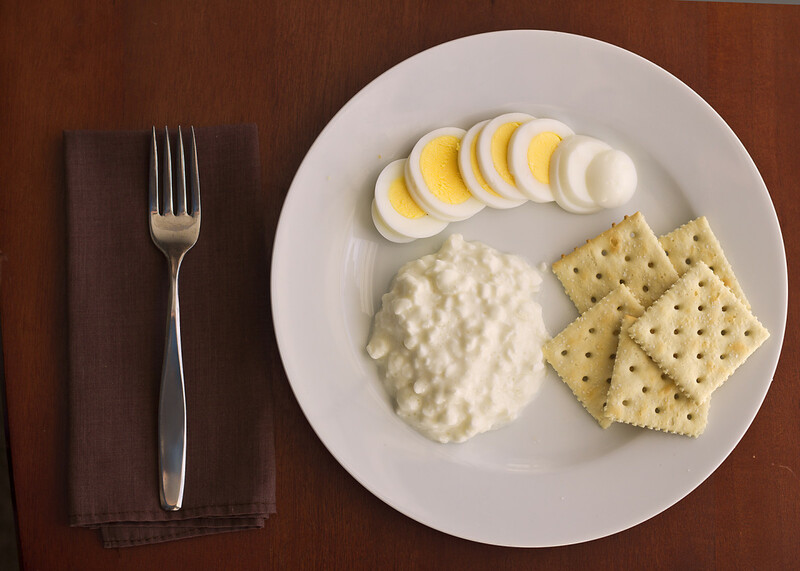 Lunch: Hard-boiled egg with cottage cheese and saltines. Dinner: Hot dogs with broccoli and banana. 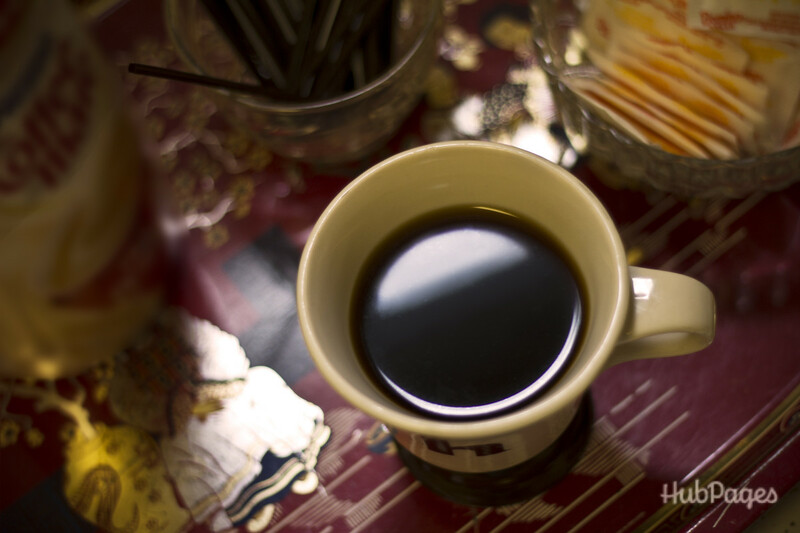 We couldn't have made it through these three days without black coffee. The boyfriend had lost significant steam today. By the time I woke up, he had come back from the gym and was feeling lightheaded. Breakfast was simple, but still resembled somewhat of a normal breakfast. I find myself staring at the clock often, anticipating the next meal. During these days, we were eating breakfast around 7 or 8 am, lunch at noon, and dinner around 5:30. I typically drink 2-3 cups of coffee every morning. The boyfriend had 2-3 every morning, and then switches to iced coffee with almond milk for the afternoon. We broke down and started drinking black coffee between breakfast and lunch. There was positively no way we were going to make it through the next 36 hours on this diet sans coffee. I enjoyed lunch, as I like cottage cheese and saltines. The boyfriend sulked through it. I gave him an extra hard boiled egg, so that his excess calories would come from protein. By the time we ate dinner, I found myself getting full way before I had finished eating. Boyfriend had three hot dogs, instead of two. When I finished eating it was really simple to save the ice cream and half a banana for a snack later, I didn't have room for it at the time! Then, it occurred to me that it was a little weird to have almost 3/4's of the days calories at dinner. Wasn't about to dismiss it yet though. Haven't gotten on the scale, but I felt like I'd already lost a couple pounds. 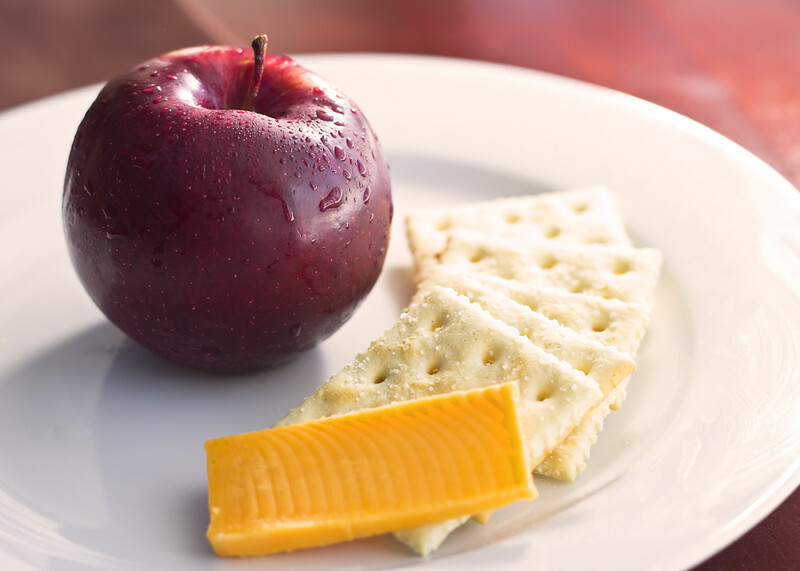 Breakfast: Cheese, saltines, and a small apple. 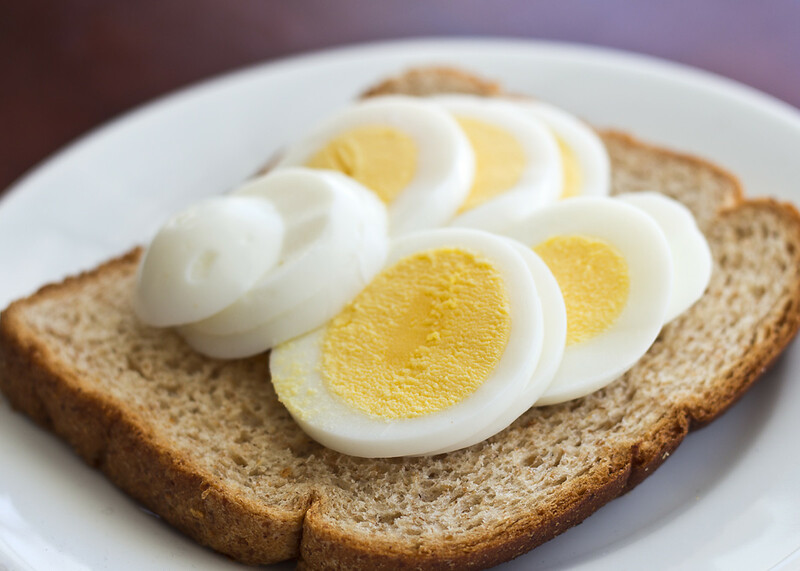 Lunch: Hard-boiled egg and toast. 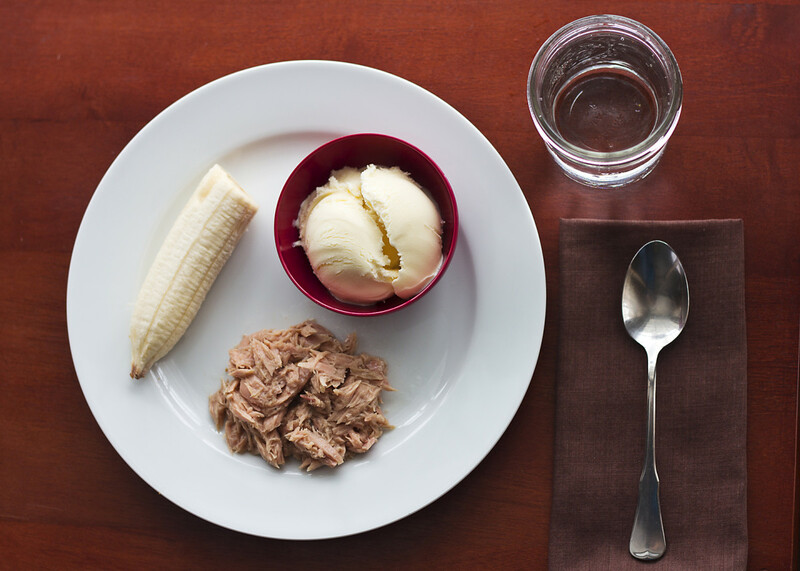 Dinner: Tuna, banana, and vanilla ice cream. This day was the easiest and the hardest. If that makes any sense. Boyfriend and I ate, then went to the gym. 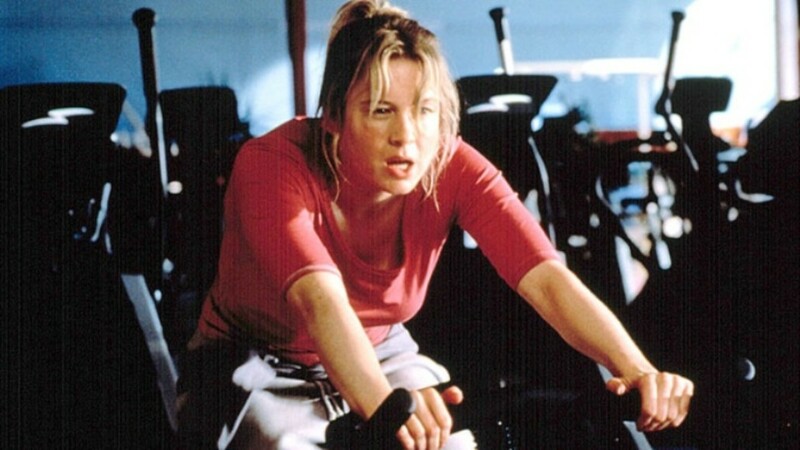 The workout was easy, but I did feel a mild nausea. It was probably my imagination, but my yoga pants felt like they fit a little less snug, and I liked that. Lunch was disappointing, but I sliced the egg so it felt like I was taking a bunch of smaller bites. We both gave in and had two cups of black coffee each. Dinner was surprisingly filling. 1 cup of tuna is about two cans. Of all the days, the ice cream was most welcomed this day. Especially topped with sliced banana! Yum! End result? I lost 4.5 pounds and my boyfriend lost 7. We're going to go back to our regular diet of mostly chicken breast and salad, so I don't expect to gain much back. This would have been really difficult to do on my own, without a support system. Every time we caught each other saying, "This is ridiculous. This can't be healthy," we would reassure each other that we had already made it halfway through. I had made a list of every meal we were going to eat, and in what order. As we crossed them out, I could say things like, "Look. We've already had five meals, we only have four left. We're more than halfway through." 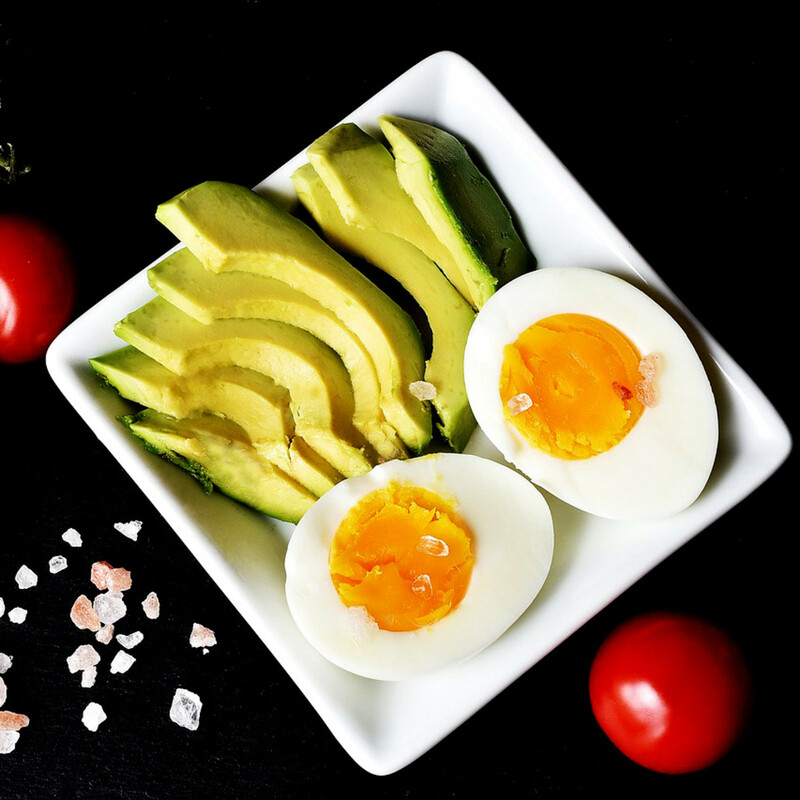 I would also suggest buying pre-hard boiled eggs or hard boil your eggs at the beginning of the week to make it easier to prepare. It turns out that not eating completely seems easier than eating small meals. This makes sense though, your body is getting hungrier because your metabolism is working extra hard. I told myself that it was a good thing. Will we do it again? I might, but I doubt boyfriend will. 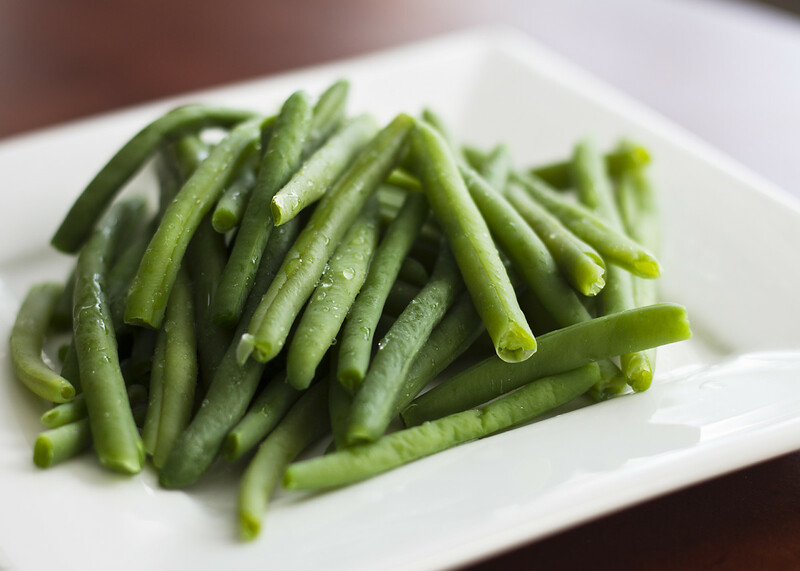 Are you going to take on "The military diet?" Can the breakfast and lunch portion be eaten at the same time and then eat dinner later. I'm not a morning person. some body please tell me, how much water do you have to drink? and What is special about the military diet menu? thanks for this useful letter ! and also i found good article about this ! Can we drink coffee every morning in thid diet? I’m 14 and I weight 156 should I do this? And like if I do should I eat like half of the food cause I’m like a teen? To the Mike A douche.. yes you can lose 5 pounds in a week, idiot. I’ll bet you $10,000 I can be 235 on a Monday and be 230 by the following Monday. Shut up if you don’t know what you’re talking about. My wife and I are on day three. I have been taking pictures of morning weight from start until now. I have steadily been decreasing and the military diet is no scam. 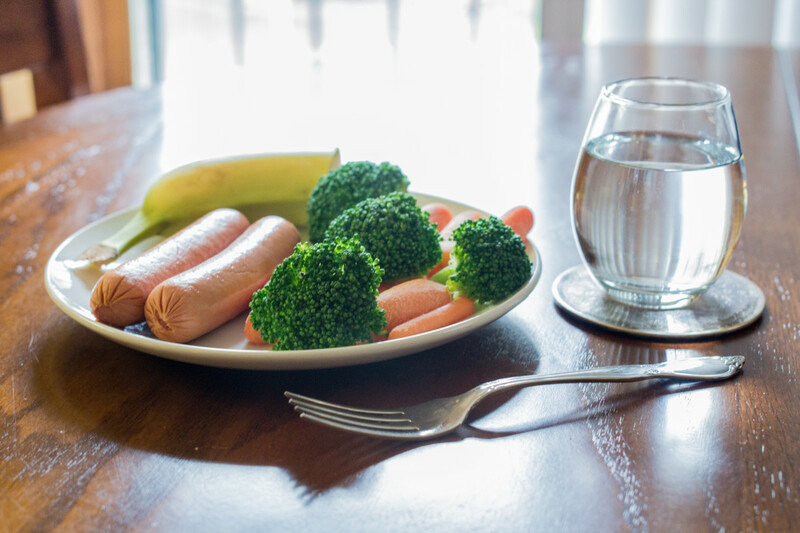 It takes a certain amount of tolerance for food that does not seem to go together in a meal sometimes, but the foods work together to balance the body's ph levels. My husband is on the 2nd day now and eats a rice cake with tuna as an in between snack. Is this advisable? He needs to lose 40kg. I have been on the military diet few times and in fact starting it again tomorrow. I use it as a means to get back to portion control and eating clean. Since I've started it I came with a trick, since the calories are so few and you end up being so hungry before lunch time. I have my dinner as breakfast except the ice cream and apple, keeps me fuller longer. For lunch I have the peanut butter plus toast for breakfast and lunch my lunch (so 2 slices) and coffee. Lots of water and green tea..
My day i's just as normal. No hunger pangs! My advice is take from the dinner items, the apple apple and banana add them to your breakfast. .. I must be super un nhealthy. After my day three(yesterday) I'm down 6 pounds. People claiming they are losing 5 lbs in a week or less are full of crap, it is physically impossible unless you are REALLY overweight. 1 pound is 3500 calories, and the average man's daily BMR is around 2000. Do the math. Even if you ate ZERO calories in 5 days you would lose 2.5 pounds... take note: 2.5 lbs lost eating exactly nothing for 5 days. Hi i lost about 3 pounds in 3 days and instead of 4 days off i did 1 day off and next 3 days almost lost 4 pounds.in this way 7 pounds in 7 days.later did 4 days off and gained back 2 pounds.now started next cycle its 2nd day today. Will do it again tomorrow and see after that. I'm hoping to loose more. I have done this diet many times. Twice last year in the summer. It works. I have found that men lose more than women on this diet. I have had lady friends do it the T and they only lost a few pounds. Another thing is to exercise during this time, that helps a lot. I completed my 3rd day and lost 2 pounds. My bread is 45 calories per slice not 100 and I don't like tuna so I had 3oz of chicken breast. I was hoping to at least lose 5 pounds. I'm going to follow lchf for 4 days and do the 3 days again and see what happens. I don't understand the 1/2 banana at the end of the day. Banana's are high in sugar (carbs and calories) I would think they would have it at the beginning of the day. Any thoughts on that? This is Day 3 of the military diet. I have followed it to a t except for two cups of black coffee. I'm 67 years old and only have lost maybe 1 1/2 pounds. By the way, I drink tons of water and still no way will I lose 10 pounds unless I cut off an arm. What to do??? HELP. GOING ON VACATION CANNOT FIT INTO MY SIZE 6 pants. Do you have to drink tea or coffee? I don't like nither could I just drink water? Hey guys! so im wanting to do this diet however i dont like tuna, is there a substitute? Im starting this diet tomorrow first day been trying so many diets hoping this one works!!! I did in fact lose 9 pounds doing the military diet. I decided since I wanted to lose 60 pounds I am going to do this every week until I get to my goal. I am going to incorporate some exercise starting next week to ramp up my metabolism faster. Only 2 days on this diet and I have lost a total of 6 pounds. I did modify this diet ever so slightly. I had celery to this with peanut butter. I see it is critical not to eat a lot of carbs, almost like Atkins. After 2 days of doing the 3 day military diet, my boyfriend and I have lost 3 lbs w/out exercising... On Day 3 of the diet and can't wait to see how much weight we lost tomorrow morning. :) I definitely will continue this diet until I reach my goal (another 26lbs) and incorporate some exercises to see how that goes. I'm on my first day, i followed the exact diet, BUT I GAINED WEIGHT!!!!! HEEEEELLLPPPP MEEEEEE!! Does this remove fat also how much water do you have to drink? In the plan, it says a slice of bread is 120 calories. But I eat healthy life whole bread which is around 70 calories for 2 slices. So can I have 2 slices? I did this diet but only lost 3 pounds. Didn't feel hungry actually felt well fed. Like you said, not sure how much military is in this and the haters are in full force nagging on anyone who calls it 'military' diet but call it what you want, it fed me and I lost some weight. I think its great for a quick fix if you intend to fit into that dress this weekend or want to really kickstart a major eating change. Started the military diet today.it was a struggle eating the 2 tbsp peanut butter for breakfast and the dry tuna at lunch.Enjoyed the dinner more. I must admit I am a bit skeptical but I'm committed to carry on for the full 3 days. Hope I get good results! Thank you for the great review and congratulations on your success. It inspired me to go on it and I did. I followed it exactly as written, drank the water, and exercised. I did feel very hungry between breakfast and lunch and lunch and dinner on day 2 and between lunch and dinner in day 3, but overall enjoyed it. I was hoping for at least a 3 pound loss when I weighed in on day 4. I lost not even a tenth of a pound. Thank you so much for sharing, I laughed out loud the whole time. I completed this 3 day diet plan a few years ago, it does work. I lost 6 pounds, about 6 pounds seems to be about average to lose. I sure did slim down. I will start on Monday and try to do about 3 or 4 rounds, hopefully I can lose 20 pounds. Thanks again! I am currently on Day 1 and made a few substitutions. I want to break a few habits and form new ones so I felt like this was a great start. Enjoyed reading your experience. Thank you for sharing! Your review was very comprehensive and I liked the fact that you've shared your personal experience with the diet. Did you have any irritability at all? I suffered a bit of irritability probably with the low carbs but I just drank a lot of water and did some light walking. Thanks for this great review! I'm sharing this to my sissies! I faithfully executed this diet for the 3 days and did not lose one single pound. I tried choking down 2 cans of tuna, but had to give up and give about a third of a can to my cat. It was also difficult to eat that much cottage cheese at one sitting. And I'm totally sick of hard boiled eggs! What country's military are eating these scant amounts of food? When I was in the Army I ate for the work I was doing which was strenuous which means I ate a lot. I added up the calories for day 1 of this plan and it is less than 1,000 calories. I hope you aren't going to try and exercise on this diet. This isn't a military diet. This is a starvation diet. 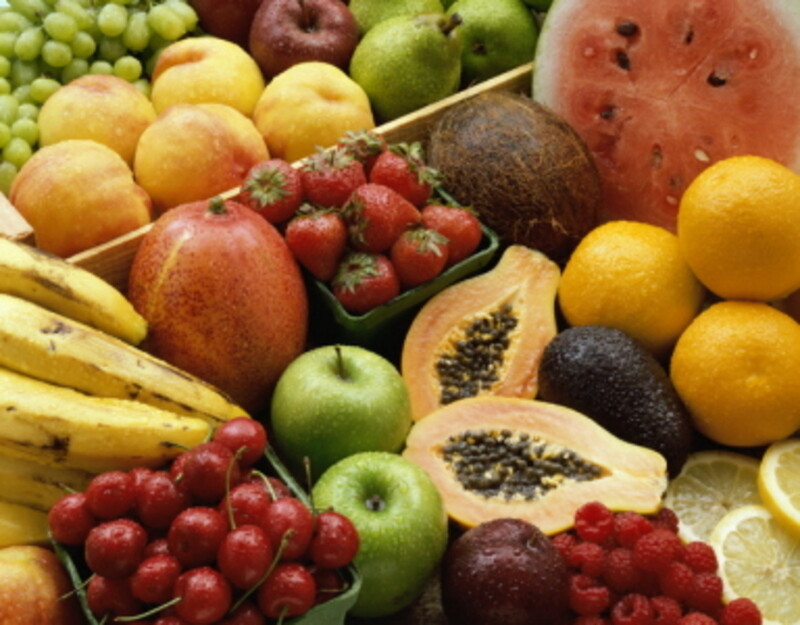 You cannot stick with this diet discussed in this article and live a healthy balanced life. There is not enough calories and seriously lacking in healthy fats, fruits and veggies. I would strongly suggest no one actually follow this diet without talking it over with your physician. Wow, those are some nice efforts. Did you ever figure out if it was water weight? I actually lost 8 pounds was kinda skeptical about it at first . Messed up on the first day ate the wrong things well ate the second day meal on the first day :D . Other than that liked it . The diet didn't seem hard to me at all tbh . I will do it again in 4 days . Isn't it funny how being happy makes you gain weight, which then makes you unhappy? Every rose has its thorn, huh. Congrats on your weight loss success. The diet seems doable, and it's only three days out of a lifetime after all. I have to admit this 3day diet really worked and helped me to control my eating habits. I lost 6 pounds yeah!! I have also started eating less portions in each meal but I still eat. I have cut down on snacking, I don't even think about it at times!!! I am going to do it again in 4 days. Wow, I actually never heard of this... I think I like the idea of a juice cleanse better - you get your fruit and veggies ( and nutrients you need) and lose the weight. Starvation diets shouldn't be used unless really necessary. I applaud your efforts with this diet plan. I'm not sure I could stick it either. I do count calories, workout regularly, and supplement but I still need to adjust my diet occasionally. It takes dedication. I enjoyed your sharing on this from personal experience.